Jeremy Martin has undeniably dominated this season. He has held the red plate after each round of the Championship. Finally, after a muddy first moto, at the eleventh round in Indiana, he is awarded the 2014 Lucas Oil Pro Motocross lites title. This is Yamalube/Star Racing Yamaha’s first outdoor championship, and will hopefully be the first of many more to come. 250 Moto 1: Jeremy Martin was second off the start. With a sixty-six point lead, he could potentially wrap up the Championship after this moto. 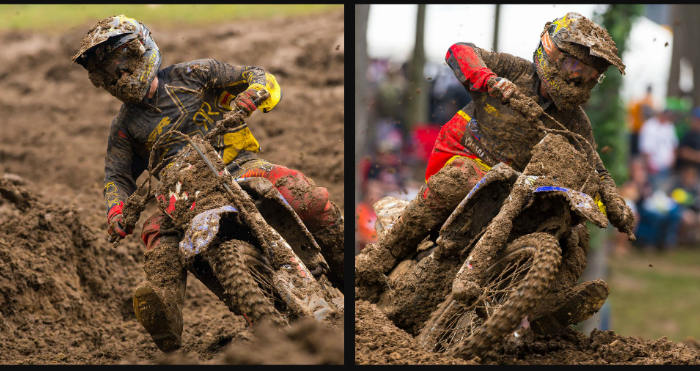 In the muddy conditions, he held his composure and maintained the second place spot. As the race came to an end, he went over the finish line jump as the 2014 Lucas Oil Pro Motocross champion. Teammate Cooper Webb started out in seventh place. He had a few spills, in the Indianan mud, but his fast pace allowed him to make up time and he finish the moto in sixth position. The second moto started with Cooper Webb in eighth position. On the first lap he went down in the sticky mud and got back up in eleventh. He fought all the way up to fifth, which was where he ultimately finished. The newly titled champion, Jeremy Martin, was seventh on the first lap. He crashed and fell back to twenty-seventh. With the championship in the bag, Jeremy no longer had to fight for points; however, he rode the Yamalube/Star Racing Yamaha all the way up to fifteenth position. Cooper Webb finished fifth overall and Jeremy Martin finished eighth. The spotlight now turns on Webb, who will be competing for second place in the championship. The ultimate round of the Lucas Oil Pro Motocross Championship will be at Tooele, Utah, on August 23.